This post is about art. There are some who’ll believe this isn’t the case, but tattoos just have a different canvass, is all. I’ve heard all the arguments against putting ink into your skin: it’s stupid, a desecration, it labels you, is the latest fashion statement, you’ll regret it… I could go on but I don’t want to. For me and a whole lot of other people, tattoos are little (or big) pieces of art we wear that have special meaning and mark a particular time of our lives. It’s a choice we’ve made, and to have those choices derided by others (and it oft is), is not only rude and offensive – as most commentary is definitely not asked for – it’s also none of your damn business. Am I angry? Damn straight I am. Tattoos were always going to be a part of my ‘art series’ posts (with a special shout out to my tattoo artist), but I’ve brought this forward because of some mainstream media coverage that specifically and unfairly targeted women and tattoos. This was brought to my attention by the lovely Maria Lewis via a Facebook post, and yes, she was just as pissed as I am about the gender disparity when it came to the reports. You can read Maria’s article here – I’ll wait why you do that…. Are you riled up yet? If not, you should be. As Maria rightly points out, at no stage did the mainstream media mention any stats with regard to men and their tattoos; at no stage was there a follow-up piece regarding men regretting their ink. But hey, that’s cool, right? Women and tattoos are a society no-no, aren’t they? Wrong, on both counts and on so many levels. As much as I’d like to put on my ranty-pants, I think Maria has covered this issue really well, and my thoughts are pretty much going to be a mirror of her words, but I will add this: I’m under no illusions that I’m sometimes judged on my tattoos, but that speaks more to the person making those judgements than to me. What I find amusing (and yes, frustrating) is other’s belief that their opinion and words are going to make an impact on any decision I make with regard to MY body. When I’m asked ‘How will my tattoos look when I’m eighty?’ Awesome, is my answer. My tattoos will bring with them memories of that time and what they represent. They’ll grow older with me, my pieces of art. So, now onto the art of tattooing, because it is an art-form; anyone who tells you different is kidding themselves. I currently have five tattoos – three very visible and two not. And yes, I said ‘currently’, I will be adding to my collection. Like the art I hang on my walls, I like art on my skin, too. Each has meaning to me; they’re a representation of who I am. I’m extraordinarily lucky to have found an amazingly-talented artist in Ben O’Grady from Lighthouse Tattoo in Sydney (he’s inked my last three). When I went to see him with my last design idea he sat me down and said no, we’re not doing that – he was seeing too much of a particular section of the design around. So out comes the pencil and within moments, he’s sketched out something so outrageously good, and so very much me, I could have kissed him. It’s that kind of skill and understanding of your client that makes a tattoo artist, and why I wouldn’t go to anyone else except Ben. I’ve often heard it said that tattoos are the latest fashion trend, that ‘everyone has them’, but while there is a growing amount of society sporting ink, there’s nothing ‘universal’ about them – this generalisation never rings true. Tattoos are a personal thing, each with its own special meaning to the wearer, each tells a story. Each is as individual as the person who’s inked. Ben’s artwork appears on my forearms, and I’ve had more people tell me they’re beautiful than I’ve had people mock, and I will pimp Ben anytime someone asks. You see, my tattoos have opened conversations with complete strangers who’ve appreciated the skill and artistry of my ink and me theirs. There’s a community within the tattooed that a lot of people don’t see; we appreciate good art, we understand there’s an addictiveness to them, and we discuss old tattoos and the ones to come. We share an experience, we share the unfair scorn and derision oft thrown our way, and we understand that no matter what others think or believe, more art will come. So the next time you’re out and see someone walking around with artwork on their skin, don’t judge, appreciate the thought, time and skill that’s gone into producing something they’re proud to wear for all to see. And maybe, just maybe, strike up a conversation and discover the story behind the art. 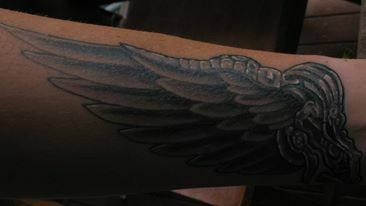 Note: the featured image, designed by David Schembri, is another piece of art Ben has inked on my skin.